"Small changes add up to big impact." Small changes add up to big impact. That's why we're inviting you to join us in a 30-day easy money makeover. We’ve set out a small to-do for every day in April. Each will help you quickly start saving money, understand more about where you are, and figure out where to go from here. Get to Know Your Money. We’ll help you dig into key details you should understand about your money situation. Keep More of Your Money. Budgeting comes down to two elements: Spend less and earn more. We’ll offer smart to-dos that’ll help you free up cash on your current expenses and find painless places to cut back. Get More Money. Generate more cash by boosting your income, investing and putting your savings to work. Protect Your Money. Life can be unexpected. Make sure to safeguard what you’ve got. Some tasks—like preparing to ask for, and then asking for a raise—build on each other. Most of these, though, are one-offs and can be done on your schedule. Follow along and don’t stress if you can’t fit in those bill-negotiation calls during your lunch break on the appointed day, or need to wait to swing a trip to the bank until later in the month. Whatever you can do will set you up for success. You might wonder: What good is a few minutes of effort? The answer is, a lot. Even what feels like a small move can have a noticeable impact on your money and your confidence. A 2018 CreditCards.com survey points to the power of spending just a few minutes on the phone to ask your credit card issuer for a better deal. Of those who asked, 70 percent successfully got a card’s annual fee waived or lowered. Those fees can range from $25 to upwards of $400, depending on the card. That would be a nice payoff. Come back to Grow throughout the month for our best tips and tricks to executing each day’s task. We’ll be right there with you throughout, sharing our stories. You won’t believe how many of us snared extra cash on Day 2. Where you are financially, right now? Here’s how to find out. We’ll walk you through key numbers and calculations to see where you’re on track, and what areas might benefit most from a few changes. States collectively hold more than $40 billion in cash and property from assets like inactive bank accounts and forgotten utility deposits. And the IRS is sitting on $1.4 billion in unclaimed tax refunds. 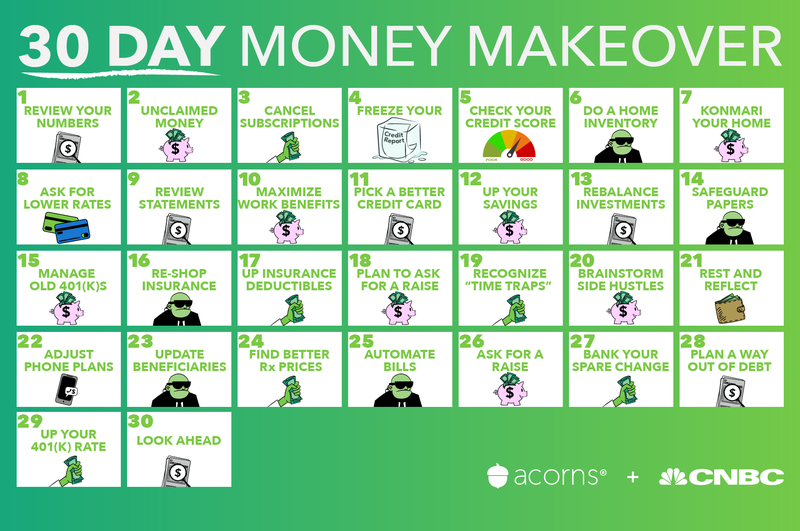 Today we’ll run through resources to check if you have free money waiting for you—and how to claim it if you do. More than 8 in 10 consumers underestimate how much they spend each month on subscription services, ranging from on-demand video to diet apps to meal kit boxes, according to a 2018 survey from Waterstone Management Group. Worse, roughly half of those folks misjudged their monthly spending by more than $100. Spotting and canceling a subscription or two you don’t use can be easy money. You’re entitled to at least one free report each year from each of the three major credit reporting companies—Equifax, Experian, and TransUnion. It’s important to do that review, and we’re going to show you what potential issues to look for. While you’re logged in, we’ll walk you through the why and how to freeze your report to limit identity theft damage. Those credit reports from Day 4 are the basis for your credit score. You’ll find that three-digit number comes up a lot: Lenders use it to assess if and how much you can borrow, and at what interest rates. The problem? You don’t have just one score. Today we’ll go over how to interpret those numbers and improve them. Creating a detailed list of everything you own is sounds like a daunting task. The good news: There are apps and other tools to make it fast and painless. And having an inventory is important in the event of an emergency like a natural disaster or a burglary. As decluttering guru Marie Kondo asks, “Does it spark joy?” If the answer for that book, sweater, or kitchen gadget is “no,” well, perhaps selling it might make you happy? We’ll share some of the easiest-to-unload goods and the best platforms on which to list them for sale. Call a credit card issuer, internet service provider or other company you do business with. Sometimes, just politely asking—for a better rate, a waived fee, and so on—can work wonders. 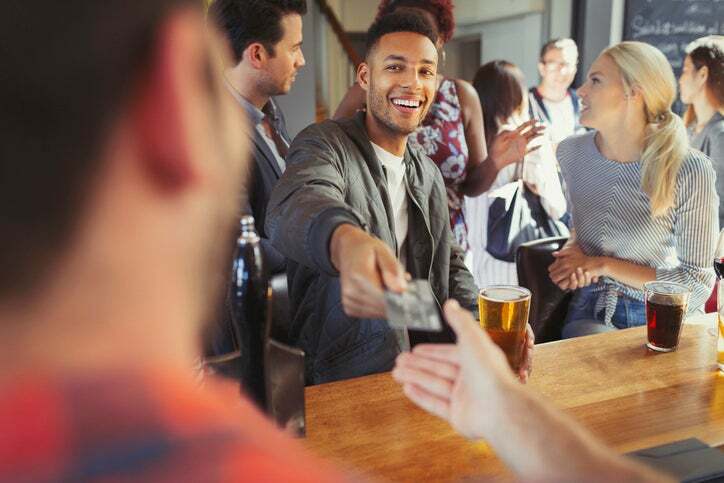 As we pointed out above, 70 percent of credit cardholder who asked to have their annual fee waived or lowered were successful, according to a 2018 CreditCards.com survey. We’re ready to offer up scripts and tips from negotiation experts, and shortcuts if you’d rather outsource that work. Taking a magnifying glass to recent paperwork from your bank, credit card, and investment accounts can tell you a lot about your money. You can find out how much you’re paying (and overpaying) in fees, where your budget weak spots are, and whether you’ve fallen victim to fraud. Today’s reading: Your employee handbook. Experts estimate big job benefits like paid vacation, health care, and matching funds for retirement are like getting an extra 30 percent in value on top of your paycheck. Spotting a few under-the-radar employee perks like exclusive cellphone service deals, gym discounts, or pre-tax commuter cash could net you even more. One in 5 consumers hasn’t shopped for a credit card in the past five years, according to CreditCards.com—and 30 percent have never changed their preferred card. If you haven’t compared credit card offers lately, you could be missing out on better terms and rewards. Put your money to work. The national average rate on a savings account is currently just 0.27 percent, according to DepositAccounts.com. Some high-yield savings and money market accounts have rates of 2 percent or better. Experts suggest checking in on your accounts no more than once a quarter. When you do look, examine your mix of stocks and bonds to make sure it’s in line with your investment strategy. If market movements have shifted it out of whack, realigning it is easy and helpful. Do you know exactly where to find your Social Security cards, home insurance policies, or the title to your car? Today’s task is to make sure you can, by collecting physical copies to store in a secure location and creating a digital backup. As we recently pointed out, smart moves with an old 401(k) could boost your savings by a lot—meaning you could end up tens of thousands of dollars richer by the time you retire. 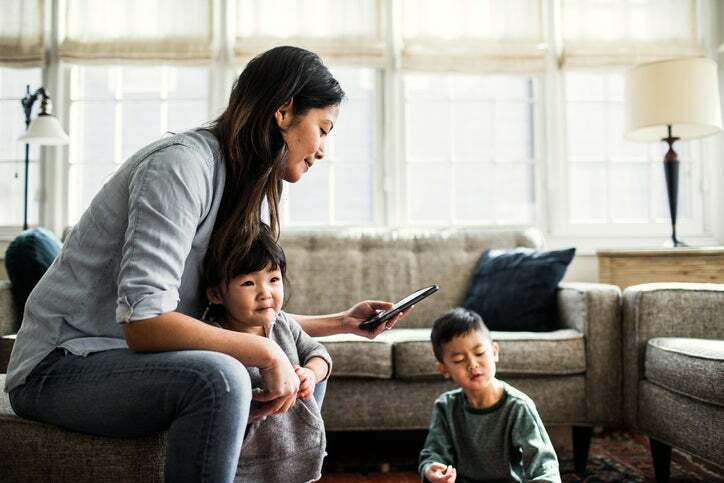 One in 3 consumers has never re-shopped their home or auto policy, according to a 2019 survey from Policygenius.com. That could be an expensive miss: Of those who did shop around, 42 percent reported switching because they found a better deal. You can kick off that hunt today with an online comparison, or by reaching out to an independent broker. Building on yesterday, it’s time to kick the tires on your policies (new or old) to see if you can get a better deal. Strategies like bundling home and auto or raising your deductible could help, and there are other potential discounts, too. Actually asking for a raise is your task for Day 26. Today, we’ll help you start laying the groundwork for that negotiation. Should you refuel at the gas station across town to save a few cents per gallon, even if you’re driving well out of your way? Thinking about the value of your time as well as money could help you find strategies that make the best use of both. Nearly 40 percent of Americans have at least one side hustle in addition to their 9 to 5 job, according to a 2018 Bankrate survey. They’re raking in an average $686 per month from those gigs. We’ll share resources to help you find a side hustle that works for your time and talents. You’re more than halfway through the 30-day challenge, so take this opportunity to pause and assess. Are there any missed tasks you need to catch up on? Do you have follow-up work, like paperwork to claim that mislaid money from Day 2? And hey, take a minute to congratulate yourself for showing up. The average monthly wireless service bill runs $38.66 per subscriber, according to data from the Tax Foundation. (Paying for your phone over time? That’s extra.) Reassessing your carrier and plan, among other smart moves, can free up cash in your monthly budget. Take a moment today to update the beneficiaries on assets like life insurance and retirement accounts. Those designations trump even what’s written in your will, if you have one. If you don’t want your ex to end up with your money if you something happens to you, make this a priority. Shopping around on prescription medications could have a valuable payoff. Recent research from PIRG found a one-month supply of brand-name insulin could run as little as $96 or as much as $445 at major pharmacies. And that’s not the only strategy that could help you reduce your costs. In a 2018 Aite Group report, 46 percent of consumers copped to paying a bill late because they didn’t have such payment systems in place. Don’t get caught in that trap. 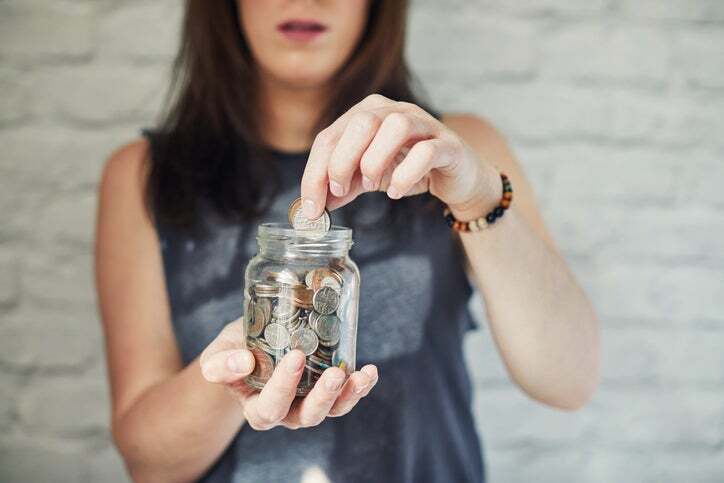 “Pay yourself first” is a key personal finance concept because it helps you stay on top of your savings and investments, as well as your bills. Most workers can expect a 3 percent pay increase this year, according to HR Source. Can you do better? You’ve done the legwork on Day 18; now we’ll help you get ready to talk to your boss. Last year, one Wall Street Journal editor, who has logged every coin he picked up since 1998, tallied his take at $971.05. That’s extreme, but exchange kiosk brand Coinstar has put the average user’s haul at $68 when they trade in spare change for gift cards. Should you start with your highest-rate debts first? Or the smallest balances? We’ll help you strategize to come up with a plan that’ll keep you motivated. All the tasks you’ve tackled to date in this challenge may have helped you create space in your budget to feel more confident bumping up the contribution rate for your 401(k). Even 1 percent extra can make a big difference. Still not there? Make today’s task one more for automation: Many plan providers will let you sign up to have that contribution jump with your next raise or another future date. Day 30: Look Ahead—What Comes Next? After a month of effort, now is a good time to check your progress. Revisit your numbers from Day 1 to see where you still need to make changes and celebrate where you’ve improved. Catch up on uncompleted tasks and think about what your next steps might be for a secure financial future.